HTML is the lingua franca of the Web. If you publish anything online, that's the format your text will end up in. But while easy for browsers to render, HTML isn't always easy (or fun) to compose. Some content management systems, like Wordpress, solve this problem by offering a WYSIWYG editor that lets you edit visually. For those who prefer the simplicity and ubiquity of plain text, Markdown is the way to go—and MarkdownPad Pro is a simple editor that lets you compose Markdown and view your results instantly. MarkdownPad's instant preview mode makes it easy to see what your final HTML is going to look like. 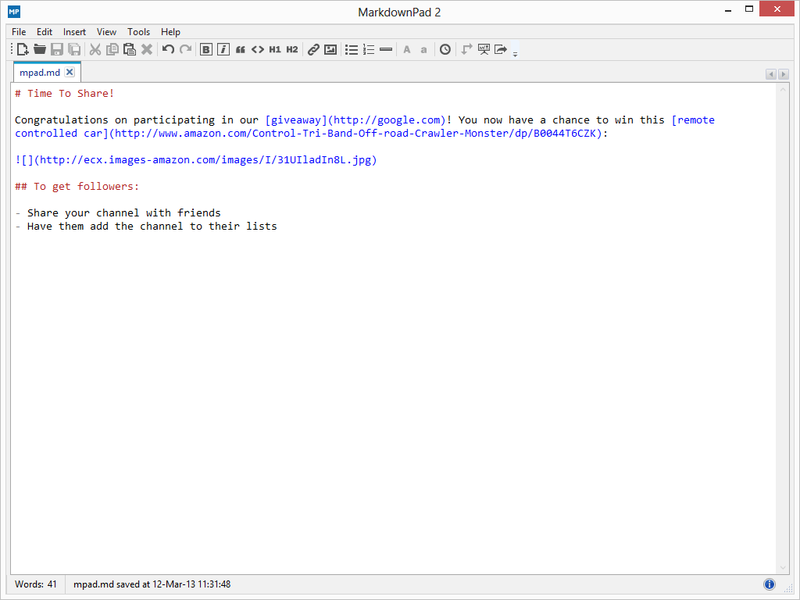 By default, MarkdownPad Pro shows a split interface, with your text taking up the left side of the window and an instantly-rendered output taking up the right—much like online Markdown editor Dillinger.io. If you find the live preview pane distracting (as I do), you can hit F5 to toggle it. If you do like it, but don't like the vertical layout, a quick tap on F4 switches the editor to a horizontal layout with the preview pane under the editing pane. Markdown is the format of choice for many writers, and MarkdownPad 2 contains several writer-friendly features: A live word count on the status bar, squiggly lines denoting typos, and frequent automatic saving are just a few. One feature that's notably missing is the ability to copy formatted text as rich text, for pasting into Microsoft Word or other rich-text aware editors–something free editor WriteMonkey offers. 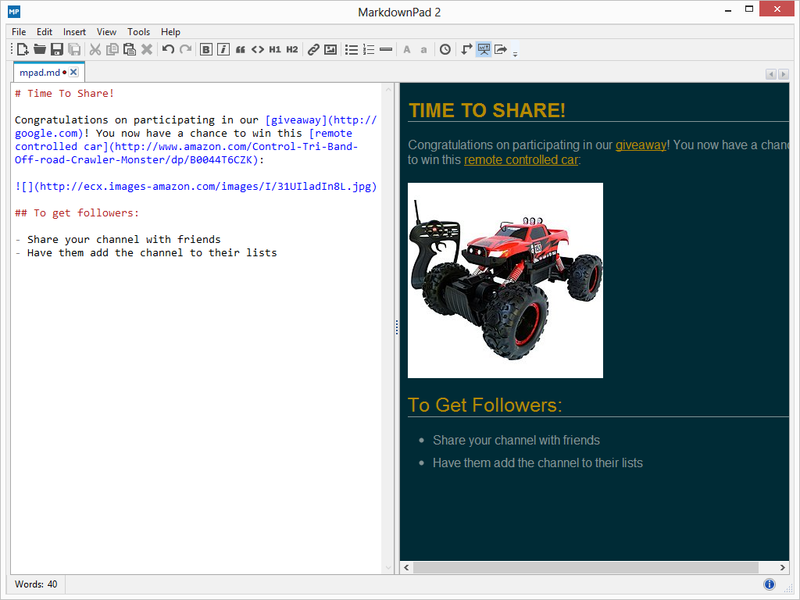 On the plus side, MarkdownPad 2 lets you directly export a PDF document from your Markdown source. If you find the instant preview distracting, you can easily toggle it off and enjoy just the Markdown syntax highlighting. Markdown is a lightweight format, so your text shouldn't be drowning in tags and angle brackets. Still, it does have its own conventions for links, titles, and text emphasis–and MarkdownPad offers syntax highlighting that makes it easy to see if you got the syntax right. It also offers toolbar buttons and keyboard shortcuts for many of the syntax constructs, but unfortunately doesn't let you customize the shortcut keys. Ctrl+K, which I would expect to insert a link, instead inserts the token for a code block (Ctrl+L inserts a link). If you find Markdown too restrictive for your needs and require more power, you may want to try Markdown Extra. 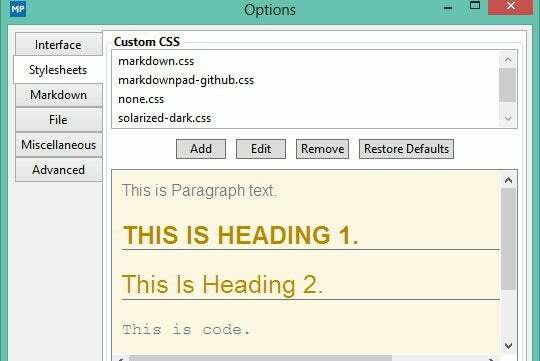 This is an enhanced version of the Markdown syntax, including refinements like Markdown inside HTML blocks, and definition lists. MarkdownPad 2 supports Markdown Extra, as well as GitHub-flavored Markdown, for composing text destined for the open-source powerhouse. MarkdownPad ships with several rendering presents, but you can edit them or add new ones if you know CSS. MarkdownPad 2 is solid, but not spectacular. I am not convinced the commercial version justifies the $15 price tag, given Markdown's inherent simplicity and the availability of free, powerful alternatives such as WriteMonkey and Dillinger.io. That said, it does get the job done, and the instant preview goes a long way towards ensuring your document ends up the way you want it to, without having to make last-minute tweaks to get things to render correctly. 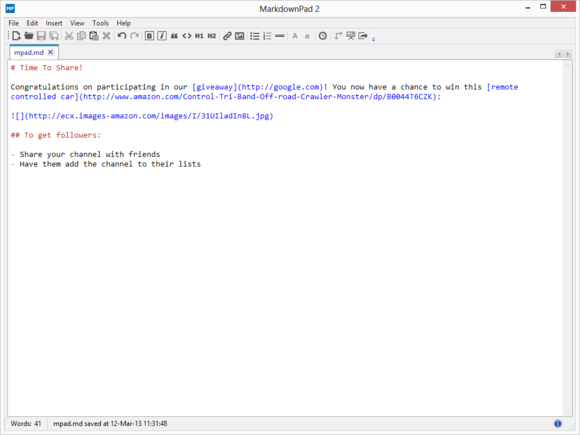 If you're disappointed with the free alternatives, MarkdownPad 2 might be worth a try. 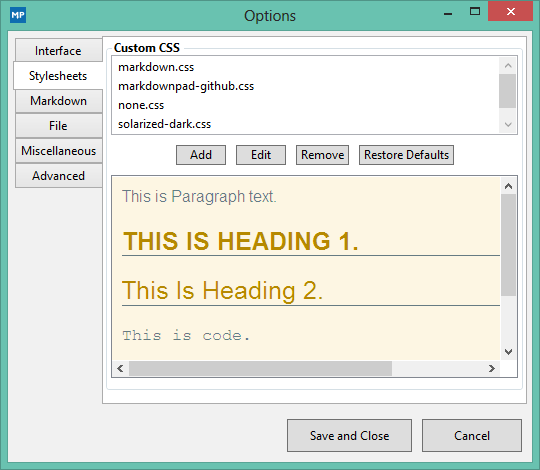 MarkdownPad Pro is excellent, but you should try the free options before paying for it.